It was later re-released in North America as part of a combo pack known as Kingdom Hearts The Story So Far alongside Kingdom Hearts HD 1.5 + 2.5 ReMIX. Kingdom Hearts Dream Drop Distance HD is an upgraded version of Kingdom Hearts 3D: Dream Drop Distance that features an overhauled battle system and improved graphics. Reality Shift and Flick Rush are now able to be performed through the PlayStation 4 controller, and new Dream Eaters have been added, such as Catanuki. Kingdom Hearts 0.2 Birth by Sleep -A fragmentary passage- tells the story of Aqua's journey in the Realm of Darkness leading into Kingdom Hearts III. Rendered entirely in Unreal Engine 4 and Kingdom Shader, it lasts as long as it takes to venture through a single world in a main-series game. Kingdom Hearts χ Back Cover is an 80-minute [please confirm] movie rendered entirely in Unreal Engine 4 and Kingdom Shader. It tells the story of Kingdom Hearts χ from the Foretellers' perspective. In this game's boxart, Sora, Riku, Donald, Goofy, and Lea are positioned similarly to Noctis and his friends in a promotional image for Final Fantasy XV. Kingdom Hearts 2.8 insert containing an incorrect release date. 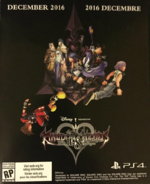 An insert for Kingdom Hearts 2.8 Final Chapter Prologue was included in releases of Final Fantasy XV. However, some of the inserts included the initial December 2016 release date that was delayed. ↑ 1.0 1.1 Square Enix Press Center, "KINGDOM HEARTS HD 2.8 Final Chapter Prologue Coming To The PlayStation®4 System"
↑ 4.0 4.1 4.2 Siliconera, "Details On What's New In Kingdom Hearts HD 2.8 And Aqua's Story"
This page was last edited on 30 March 2019, at 20:08.